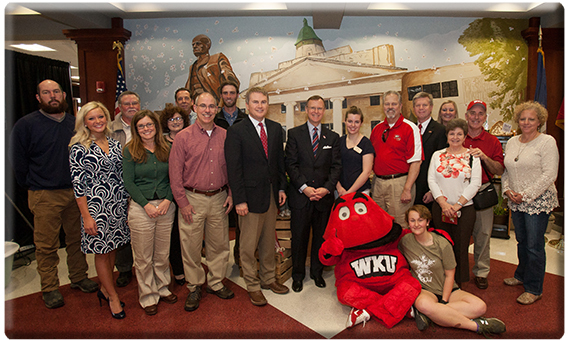 BOWLING GREEN, Ky. – Agriculture Commissioner James Comer officially inducted Western Kentucky University as the 10th member of the Kentucky Department of Agriculture’s Farm to Campus Program in a ceremony today on the WKU campus. Warren County produced more than $114 million worth of agricultural products in 2012, ranking ninth in the state, the U.S. Census of Agriculture reported. Warren County is among Kentucky’s top counties in production of corn, soybeans, hay, cattle, wheat, hogs, poultry, and milk. Farm to Campus is the official state program for connecting Kentucky farmers and food producers with Kentucky higher education institutions. Under the Farm to Campus program, the Kentucky Department of Agriculture helps participating institutions locate and purchase fresh Kentucky Proud products to serve in their food service systems and shelf-stable Kentucky Proud products to sell in their campus bookstores. Western Kentucky University joins Asbury University, Campbellsville University, Eastern Kentucky University, Georgetown College, the University of Louisville, Morehead State University, Murray State University, the University of Pikeville, and Transylvania University in the Farm to Campus Program.